This will be the first phase of a three phase construction project that is estimated to take 18 months. Once complete, the Connector will have sidewalks, bicycle lanes, lighting, and landscaping, as well as upgraded storm sewer systems. Phase 1 will begin just west of Nussbaum Avenue and will realign Little Richard Penniman Boulevard through the intramural field to cross Telfair Street and end just east of it. Phase 1 will also include realigning Edgewood Avenue into the new Connector. Phase 2 will begin at the realigned Edgewood Avenue and go up to where the Connector will later be built over the railroad. This phase will also include the realignment of Second Street into the Connector. Second Street will also be improved from the new Connector, across Hazel Street, and up to Oglethorpe Street, including a major storm sewer improvements under Hazel Street. Phase 3 will be the construction of the new Connector over the railroad and tying in Phases 1 and 2 to complete the project. Construction on this phase is expected to last between three and four months. To minimize construction time and reduce expenses, the entire portion of Little Richard Penniman Boulevard between Plant Street and Telfair Street will be closed beginning Monday, April 6. People traveling into Macon-Bibb from I-75 are encouraged to use the Eisenhower Parkway or Forsyth Street exits to reduce traffic traveling through the neighborhoods. There will be detour signs placed in the area to help neighborhood traffic get around the construction. Any closures occurring with Phases 2 and 3 will be announced closer to the start of construction for them. The Second Street Corridor redevelopment and revitalization project was started with funding from the voter-approved Special Purpose Local Option Sales Tax (SPLOST). Eight million dollars was designated to improve the area that stretches from East Macon through Downtown, connecting to Little Richard Penniman and Mercer University Boulevards, and creating gateways into Macon-Bibb at either end. 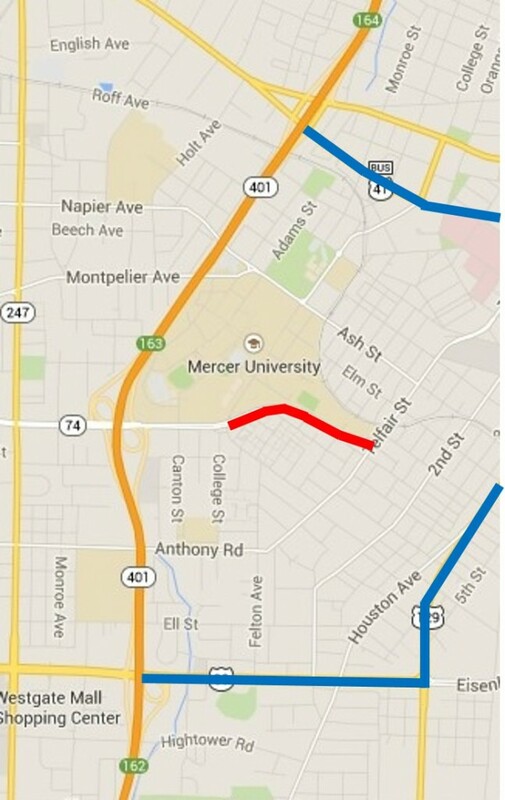 Long-term, Macon-Bibb County wants to extend the Corridor further west along Mercer University Boulevard to the Macon Mall and Middle Georgia State College. This past December, Macon-Bibb County reopened the block of Second Street between Cherry and Poplar Streets as a Vision Block for the Corridor to show people what will the entire street will look like. It features bike lanes, reverse angle parking, landscaping, shade trees, benches, improved sidewalks, an irrigation system, and more. In addition to the work being completed with SPLOST funds, Georgia Power, Atlanta Gas Light, and the Macon Water Authority used this opportunity to upgrade and improve its electrical system to meet the growth taking place Downtown. Click here for a MaconBibbTV feature on the Vision Block. As a part of the redevelopment plan for Second Street as a “complete street,” a transit alternative for connecting east and west Macon needed to be identified that could serve as a backbone to a larger regional system. Long-discussed as a fixed light rail system connecting the different areas, another alternative is currently being explored: an electric bus system. In late February, a team from Macon-Bibb County, the Macon Transit Authority, and Strong Cities, Strong Communities (SC2) visited Tallahassee, FL, and StarMetro – the city’s public transit provider – to learn more about its electric bus system. In August 2013, it was the first transit agency on the east coast to deploy electric buses, and those buses are now 5% of its fleet) and serve a fixed 18-mile route. Click here to read more about the visit and this alternative. Macon-Bibb County is currently developing Mid-City Square, a new park located at the intersection of Second and Pine Streets. Several of the properties have been purchased and the buildings have been torn down to make way for new greenspace. Also, work is set to begin soon on the creation of Pinnacle Park on Second Street in the Tindall Heights neighborhood. Located on the site of the former Boys and Girls Club, it will be a passive park with trails, benches, landscaping, and a great view of Downtown. Using Tax Allocation District bond funding, Macon-Bibb will be building a signature pedestrian bridge over Mercer University Drive that will serve as a gateway into the city. Its construction helped bring almost $50 million in investment in Tindall Heights.